BOUNDLESS at Kai Lin Art. | Todd Monaghan. |X| Larry Jens Anderson. |X| Elison Roshi. | | Quiet Lunch. BOUNDLESS at Kai Lin Art. | Todd Monaghan. |X| Larry Jens Anderson. |X| Elison Roshi. 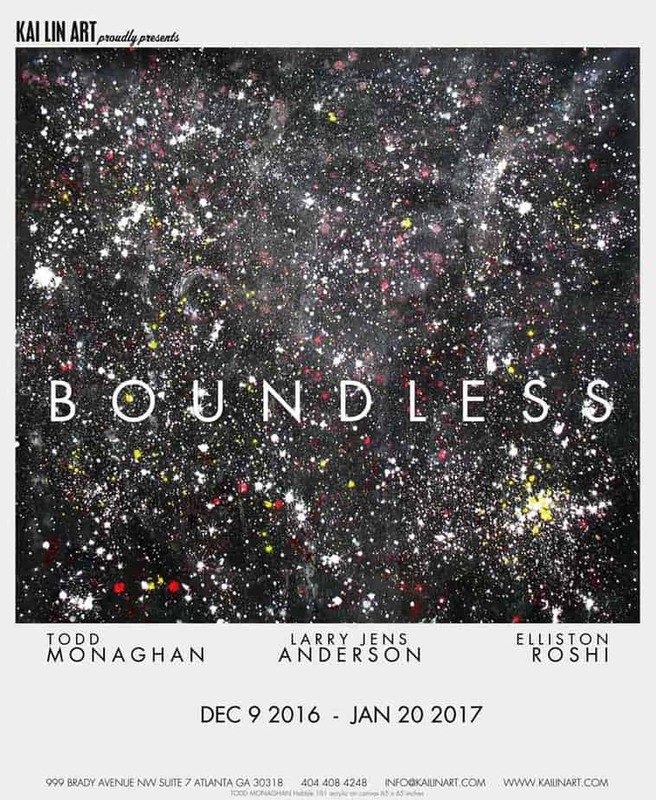 BOUNDLESS, featuring new works from TODD MONAGHAN, LARRY JENS ANDERSON, and ELISION ROSHI, is an exploration into the human psyche and the human condition through immersive, intuitive and the unconventional. Kai Lin Art is excited to welcome New York based spiritual surrealist, TODD MONAGHAN into our stable of artists. In this solo exhibition of works on canvas, Monaghan applies paint by flicking, spilling, and dripping into a textural, immersive, multi-level artworks. Monaghan’s painting engages formally with line and density on a large scale and thematically stare into the widest scope of all: our boundless universe. Stretching as large as 118 inches, these paintings relate to the individual and whole of the cosmos in their gripping, expressionistic approach. Monaghan has exhibited in New York, Atlanta, Miami and various galleries across the United States and abroad and his works have been collected by academic, corporate and private collections worldwide. LARRY JENS ANDERSON is a prolific Atlanta based artist with a wide breadth of artwork in many styles and themes including gender, sexual identity, human rights, politics, religion and mortality, often referencing his family history. Anderson, who was born and raised in the small town of Randall, Kansas, has traveled and taught in both France and Italy where much of the inspiration for the pieces in BOUNDLESS comes from. Anderson’s drawings are elegant and beautifully rendered expressions of thought provoking and intensely personal subjects. Across multiple mediums, the viewer escapes into humor to seriousness, through love and meditations on the human condition. Anderson’s works have been exhibited in Hong Kong, Germany, Belgium, Japan, France, Italy, Australia, New York, Chicago, Los Angeles and throughout the USA. He is included in many corporate collections as well as the High Museum of Art, The Museum of Contemporary Art Atlanta, The Mint Museum Charlotte, Wichita Art Museum, and the Museum of Modern Art. ELLISTON ROSHI practices spontaneity and respect for materials in his process. These artworks manifest as a double layered painting where colorful mixtures of Japanese sumi ink, charcoal, and watercolor on the underside of the framed glass interacts through light and perspective with the complimentary painting beneath the glass. These combinations are one where the sum is greater than the parts. The abstract relationship of each layer to the materials reveal a way of looking at beauty in the world. Roshi is an ordained abbot and guiding teacher at the Atlanta Soto Zen Center and has taught design at University of Illinois SAIC. 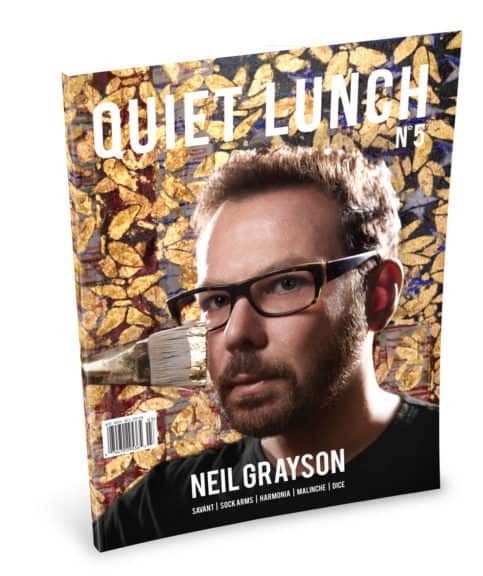 Quiet Lunch is a grassroot online publication that seeks to promote various aspects of life and culture with a loving, but brute, educational tinge. When we say, “Creative Sustenance Daily,” we mean it.